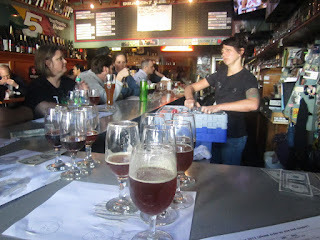 The weekend I recently spent in Oakland happened to coincide with the final days of San Francisco's annual SF Beer Week. That was why Beer Revolution had an L.A. brewery takeover when I was there, and it's also why I was able to partake of some lip-puckering Cantillon drafts -- Mamouche and 2010 Iris -- that Saturday evening at The Trappist. 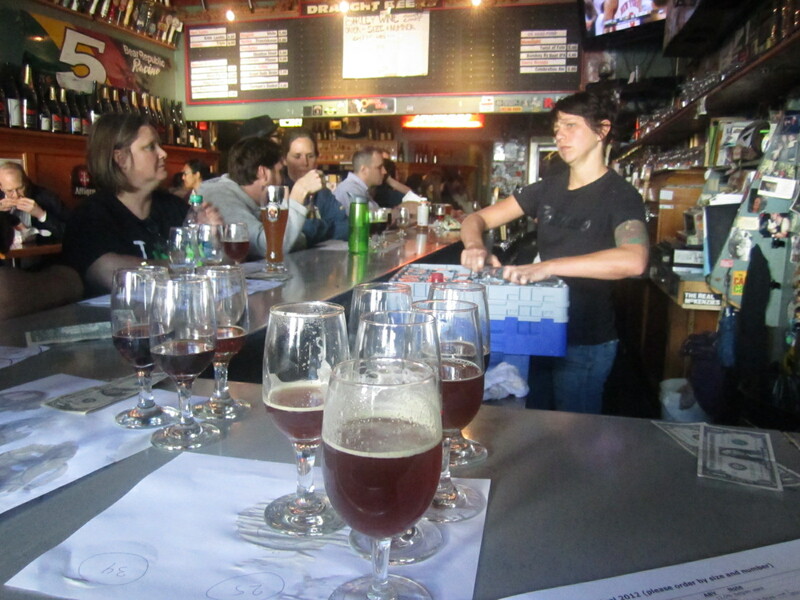 Another legendary SF Beer Week event is the Toronado Barleywine Festival, and on Sunday morning I couldn't resist heading into the City on BART for that, especially since I knew I was going to have to miss the Lucky Lab Barleywine Festival in my own hometown. Publicity for the event said it would begin at 10 AM, and following the "arrive early" rule of thumb for festivals, I walked past Toronado a little before 10 while searching for some pre-barleywine breakfast. There was already a line of perhaps a dozen people waiting out front. Alaskan Rough Draft 2011 -- fruity, too sweet, "tootsie roll"
Getting to the festival early was definitely a good idea. Sitting at the bar, I was treated very well by the notoriously touchy Toronado staff, who did a good job keeping the samples flowing. There were two sizes: small (3 oz.) and medium (6.5 oz. ), $3 and $5 respectively, though sometimes the smalls seemed to be as full as the mediums. Apparently there was a large serving in years past, but experience had proven that to be a bad idea. If you go to the fest, remember this trick that Ezra told me about: bring an empty six-pack holder to carry your samples back to your table, since you'll want to order a few at a time. It ended up not mattering for me since I found a seat at the bar, but the people with six-packs were definitely having a nicer time of it.